Gamers and sneakerheads alike will soon have yet another way to express their love of the game courtesy of Sony and Nike. 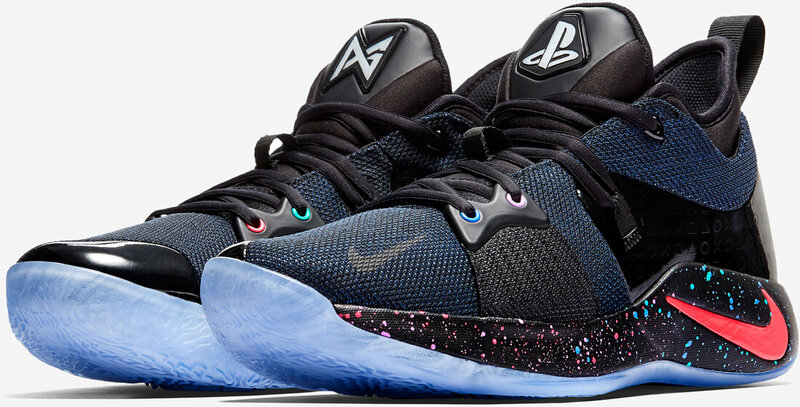 The PG-2 PlayStation Colorway sneakers, developed in collaboration with Oklahoma City Thunder baller Paul George, were inspired by Sony’s popular game console. The tongues of the shoe sport the PG and PlayStation logos which light up blue thanks to a built-in lithium battery. There are three modes - off, on and pulse - that are controlled by a power button on the backside of the tongue. According to Engadget, the battery offers more than 150 hours of runtime, is non-removable and cannot be recharged. As such, you’ll want to use it wisely. The midsole and sock liners are based on the PlayStation Galaxy theme while leather on the outside features Sony’s familiar button symbols. The eyelets are based on classic PlayStation colors and there’s even a unique barcode containing a PSN voucher code on the back heel of the left shoe for a Paul George Dynamic Theme for your PS4. Paul George’s new signature shoes launch globally on February 10 for $110. As you’d expect, they’re a limited edition run meaning they’ll likely be difficult to come by. If you’re set on adding them to your collection, you’ll need to act accordingly. The styling certainly won’t appeal to everyone although I suspect that won’t matter much to diehard Thunder fans and shoe collectors.